Nicole Danaher, LPN (pictured here with Angie Mainello) has been an employee at Van Rensselaer Manor since 2001. She started out as a CNA and utilized tuition waivers offered to Rensselaer County employees in order to obtain her LPN degree. 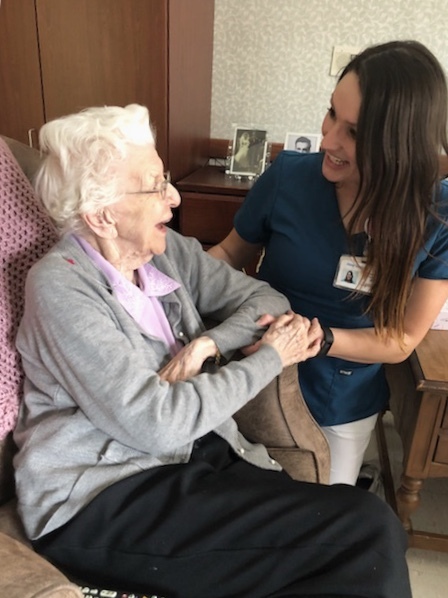 She is now working toward her RN degree and has always been a persistent and vocal advocate for the elderly including our own Angeline Mainello. In 2017, she received an educational scholarship through ANSA to provide assistance in paying for her tuition to become a Registered Nurse. lightly,nor is it easy, but I am proud to say it is one that I love”.